The business impacts of social networking: eventually ubiquitous? I am pleased to introduce within this blog a contribution by Cecile Demailly, a member of the Boostzone Institute, on several documents she produced after having been working on social network implémentation with a large client of her. Web 2.0 is often viewed as a technology revolution (open source, interoperability, SaaS and other SOAs), or possibly an economic revolution (new business models, globalization, empowered customers), but less often a social revolution (networks, shared values, diversity, intergenerational gaps and dialog, etc). We can discuss endlessly to figure out if the technology created the move, or if the change in attitudes fueled the innovation; if the business perverted the market, or vice versa – to me it is just rhetoric, kind of chicken and egg questions. The sum of it, somehow, makes it part of a broad society change. It is a pervasive transformation eventually touching most actors, activities, tools and behaviors. 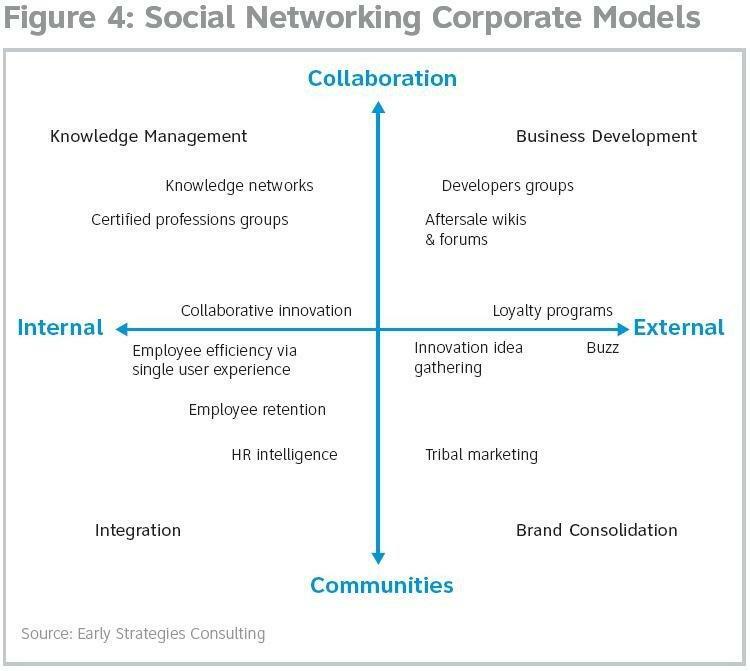 When thinking to the enterprise, it mostly takes the form of the advent of social networking, this wording encompassing not only social networks (among them rich corporate directories), but all sorts of collaborative and communities projects. I acknowledge that naming it that way makes many experts’ hackles rise, though I find it more meaningful than Enterprise 2.0, especially speaking to non-experts. Some time ago AT&T hired my consultancy Early Strategies to research about the business impacts of social networking, and fuel the debate with some of its strategic customers. It resulted in two white papers, The Business Impacts of Social Networking (11-08) and Speeding the adoption of Enterprise 2.0 (just out), and a webcast (03-09) – that I’m happy to share with the Boostzone community today. These predictions are explained and developed in the first white paper, to a larger extent for « Corporations will change the way they communicate », « Corporations will change their organization » (with an accent on people managers, IT teams and knowledge managers), and « Corporate adoption will happen at different speeds » (in the second white paper). Speed: will the corporate world ever keep up? The interest level and the good reception got by the exercise confirmed that many companies have that transformation in their strategic radar. And probably some of them will adopt social networking a bit faster than planned, just because of the crisis and its « adapt or die » Damocles sword. Cécile Demailly is the founder of Early Strategies, a consultancy boutique that helps corporations with disruptive changes – revamping the strategy and adopting them successfully. She is a member of the Boostzone Institute. Her white papers developed for AT&T can be found in AT&T Enterprise Networking Exchange portal under Trends.